Next Tuesday, Madden NFL 25 will hit the current generation of platforms, the PS3 and Xbox 360, giving eager sports fans their annual fix. However, before those gamers hand over their $60 they might want to see the game in action, and so we have recorded a lengthy gameplay video to fill just that purpose. Our video briefly touches upon the improvements made to Madden NFL 25‘s Ultimate Team and Connected Career modes, but it’s mainly an opportunity to see the on-the-field play. And for those who enjoy some musings on awkward coach animations and John Tesh, our commentary has you covered. While the gameplay itself is solid as far as EA Sports games go, one problem that kept coming up time and time again with the game involved the opposing AI sitting still. It happened a few times during this video, and completely broke up the pace of play. What’s more frustrating about this occurrence is that the opposing team isn’t doing it to run out the clock – it actually seems like a loading point in the middle of the game. Viewers will also notice that the visuals in Madden NFL 25 are a little lacking compared to current sports games. That might be because we’ve already seen what the next generation of Madden will look like in the Xbox One and PS4 versions of Madden 25, but either way the visuals did not impress. The game also defaults to the same animations far too frequently, especially the animation where a player heads to the sideline for a drink of water. 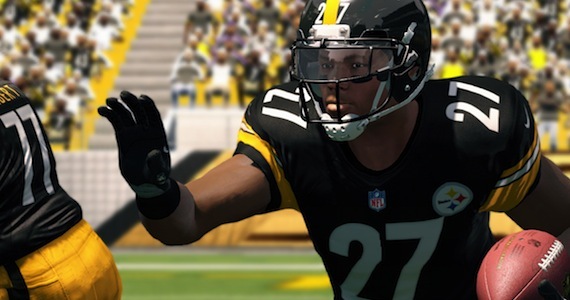 In our review of Madden NFL 25, we highlighted many of the game’s shortcomings, but we hope that this gameplay video contextualizes our key issues. There’s no denying that the collisions and run physics are much more realistic this time around, but everything else is either on par with last year’s Madden NFL 13 or is, surprisingly, a step down. At the end of the day, though, Madden is still Madden, and for those who need to pick up each annual iteration this video proves that nothing is broken as far as the core mechanics are concerned. Granted, the game is still a lot of fun, it just doesn’t warrant another $60 purchase. For our full thoughts on the game make sure to read our Madden NFL 25 review. And if you enjoy our gameplay videos please like and subscribe. What do you think of Madden NFL 25‘s gameplay? Do you plan on picking up the game? Madden NFL 25 releases August 27, 2013 for the PS3 and Xbox 360.